Each January, the Allstate Sugar Bowl sponsors the National Prep Basketball Classic featuring multiple brackets for both boys’ and girls’ high school basketball players. It has featured teams from Alabama, California, Florida, Georgia, Louisiana, Mississippi, New York, Oklahoma, Pennsylvania and Texas. While the event started with eight teams in 2011, it is expected to grow to more than 64 teams in 2019. The tournament will feature at least eight out of state participants. In addition, in 2018, the tournament organizers, Friends of Prep Sports LLC, awarded four $1,500 scholarships to deserving student athletes in the tournament. Ten Louisiana state basketball champions and 13 out-of-state schools highlight the field in the 2019 Allstate Sugar Bowl National Prep Classic. Overall, 68 teams will compete from January 2nd-5th at the Alario Center in Westwego, La. Daily admission is $10 for adults, $5 for students (with student ID) and children. There will be a total of five championships awarded in the event. Boys will compete in a 16-team National Bracket as well as an eight-team State Bracket. There will be three girls’ divisions – a 14-team Platinum Bracket, a 14-team Gold Bracket and a 16-team Silver Bracket. The boys’ national bracket features top seed Bishop Loughlin (Brooklyn, N.Y.), Carver (Montgomery, Ala.), Christ School (Arden, N.C.), Lee (Huntsville, Ala.), Lakewood Ranch (Bradenton, Fla.), Miami (Fla.) Palmetto, St. Rita of Cascia (Chicago, Ill.), Silsbee (Texas) and White Station (Memphis, Tenn.). Carver and Lee feature two of the top recruits in the class of 2019 in Jaykwon Walton and Kobe Brown, respectively. Looking to hold off the out-of-state challengers in this year’s event will be tournament host Riverside Academy (Reserve, La.) 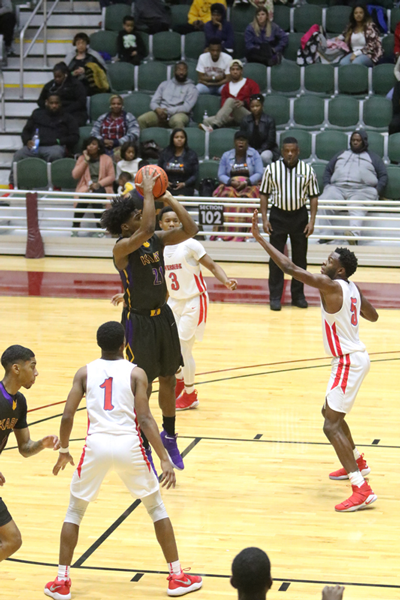 which won the Allstate Sugar Bowl National Prep Classic for the fourth time in eight seasons with a 61-55 overtime victory over Edna Karr last January. Louisiana champions in the boys’ brackets include Walker (5A), Madison Prep (3A), Scotlandville (Division I), and Lafayette Christian (Division IV). The girls’ brackets will feature six Allstate Sugar Bowl/LHSAA state champions, including Warren Easton (4A), Loranger (3A), North Caddo (2A), Ursuline (Division II), St. Katharine Drexel (Division III) and John Curtis (Division I). In 2018, John Curtis won the Girls’ Platinum championship by defeating Kenwood (Ill.) Academy in the finals. Riverside Academy captured its fourth boys’ title in six years at the Allstate Sugar Bowl National Prep Basketball Classic on Saturday evening at the Alario Center. John Curtis Christian School earned the Girls’ Platinum title while Lafayette Christian won the Gold Bracket and Dominican took the Silver Bracket title. In the boys’ championship game, Riverside improved to 22-0 on the season with a 61-55 overtime victory against Karr. Jared Butler, an Alabama signee, scored a game-high 26 points, including four three-pointers, while adding six steals, five rebounds and five assists. The 6-3 guard was named the tournament MVP. In addition, in 2018, the tournament organizers, Friends of Prep Sports LLC, awarded four $1,500 scholarships to deserving student athletes in the tournament. The sensational Ja'Vonte Smart scored 40 points, including 25 in the second half, to lead Scotlandville, from Baton Rouge, to a 66-63 win over Christian Life Center Academy of Kingwood, Texas, for the boys' championship. Smart was named the tournament's Most Valuable Player as Scotlandville improved to 17-1 on the year. CLCA dropped to 11-6 overall. Two-time Louisiana Player of the Year Cara Ursin posted a dominant second-half, scoring 20 of her 27 points to lead Destrehan to a 68-61 victory over John Curtis in the Girls' Platinum Bracket title game. Ursin, who was named the Platinum MVP, had three 27 point-games and one 29-point effort in the tourney. Destrehan's Kiki Kenner added 18 points in the win after scoring 25 in the semifinals. The Wildcats improved to 20-0 on the year while the Patriots dropped to 18-2.